♦GARDEN GNOMES BEWARE!! - CCOQUS THE BLACK BEAR GNOME EATER - Has Come to Keep All Those Little Garden Gnomes in Their Placee! - In Fact,CCOQUS's Arrival in Your Garden is All The Gnomes Are Talking About! ♦FANTASTICLY DETAILED AND HAND PAINTED, He's Been Wonderfully Designed By CCOQUS. ♦MEASURING JUST OVER 10 INCHES TALL - Will Keep All the Little Gnomes In Your Magical Garden On Their Toes! 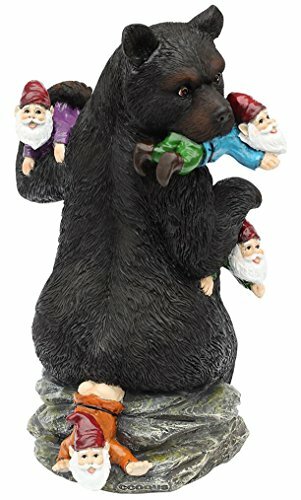 ❤-BEST FUNNY GARDEN DECOR - this beautifully hand painted bear eating gnomes is sure to be the centerpiece of your garden ,There is no doubt that it will give an exuberant performance to your garden. ❤-DON'T WORRY - only eats gnomes and not dogs, mail men or neighbors. Perfect gifts for gnome lovers or haters, Moms, Dads, Daughters, grandparents. Wonderful housewarming gift. ❤-HIGH QUALITY - handcrafted and made from light durable resin material. ❤-MEASURING JUST OVER 10 INCHES TALL-Big enough to be noticed but small enough to fit on a bookshelf. Perfect size for many locations. ❤-Guaranteed to make the number of gnomes in your garden greatly decrease. If you have any questions about this product by CCOQUS, contact us by completing and submitting the form below. If you are looking for a specif part number, please include it with your message.